This then is the Mad Catz STRIKE 5, the inevitable cheaper little brother to the impressively mad STRIKE 7. Well, I say cheaper, but it isn't cheap. It's still hitting the shelves at nearly £200, which is a lot of cash to drop on any gaming peripheral and really only something to think about if you've already bought every single other performance component that could help your rig. After all, you could buy an awesome graphics card for that much cash, and still have change. So what is missing in this cut-down STRIKE? Well, interestingly, I'm not entirely sure that you are missing very much at all. The big feature of the STRIKE 7 was the VENOM touchscreen interface module, and I have to admit that I wasn't a big fan of the resistive technology it employed, or the lack of any meaningful or useful applications for it. Mad Catz has promised that it's been in touch with publishers and developers with the SDK, and is expecting new applications to come through, but a couple months have passed since its release and we're still waiting. The EYE OLED module, however, is actually a little more functional out of the box. The nine numbered buttons aren't particularly inspiring and also seem a little flimsy, but they're simple to program and use. The little OLED screen in the EYE though can show a myriad of different things, from the mic and speaker volumes to the icon of whatever app you've programmed it to open with a flick of a switch. The feel of the physical buttons aside, I'm actually really impressed with how functional the EYE module is, and I think I prefer it to the VENOM touchscreen because of its usefulness. The rest of the board is much like the STRIKE 7. This does mean you're limited to rather dead-feeling membrane-switch keys, but although they're not too nice under your fingers, they are very responsive when you're gaming. The STRIKE 5 also has the modular approach of its brethren, allowing you to configure the keyboard in a variety of different ways depending on the space that's available, or your dominant hand. I have to say I like the way you can cut it down to be a very functional compact keyboard by removing the number pad, however, without that side panel you also lose any cursor keys which might be an issue for you. While I do appreciate the design ethos behind the STRIKE range, I'm not a massive fan of the aesthetic, and I'm definitely not as blown away by it in day-to-day use as I am by the - admittedly far more expensive - Razer DeathStalker Ultimate. 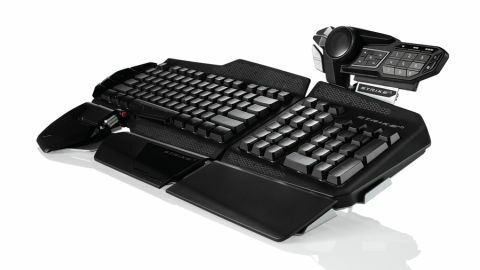 Strangely, I think the STRIKE 5 is a more useful option than the STRIKE 7, but if I was going to spend this sort of money on any keyboard I wouldn't hesitate to look more closely at the Razer offering instead. And if I couldn't stretch that far? Well, Gigabyte Aivia Osmium is less than £100, and is one of the finest mechanical switch keyboards that I've had the pleasure of playing with, and that's despite its lack of touchscreen.